This dream typifies the feeling of VERATRUM ALB. This man behaves as if he is reacting to a loss of social position. He is like a king who has suddenly become a pauper. If he is to “survive” he has to tell lies and make a show of wealth. He has to squander money and speak highly of himself. He needs to create about him an aura of grandeur. A child moved from Eastern Europe to London with her family. The parents work hard but not at the jobs they are trained to do. The child’s English is good and her parents’ English is quite good. At home she chatters away and is outgoing, at school she refuses to speak at all and is withdrawn. Day after remedy was speaking at school. Mirrilli: Delusion he is dumb. A five year old autistic child has an older sister with mental health problems and a younger sister. The symptoms that the mother is most distressed about are that the boy runs away and hides to pass a stool and then eats it. After the remedy he ate his stool once in first week then not at all. M; Mind; FECES, general; swallows, his own: camph., hyos., merc., verat., visc. Both these cases yielded to VERAT ALB 1M, the autistic child had VERATRUM ALB 1M weekly the other single split dose. 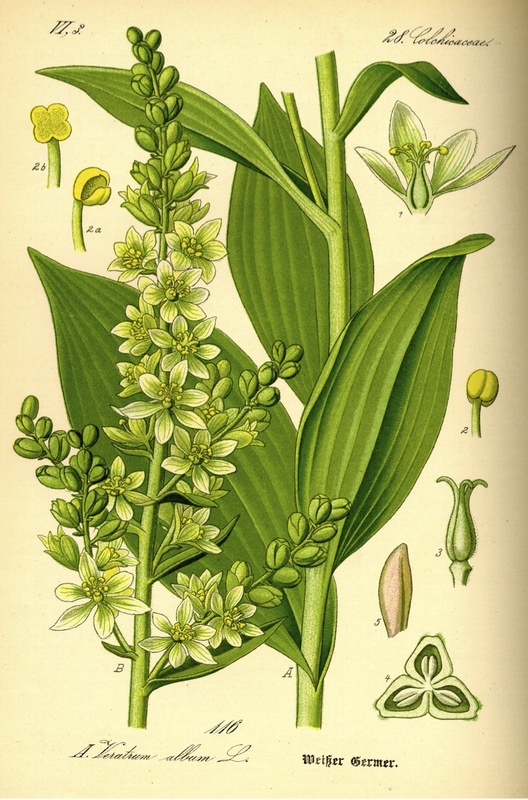 VERATRUM ALB is in the Liliiflorae family (along with LILIUM TIGRINUM, SABADILLA, SARSPARILLA, ALOES, PARIS QUADRIFOLIA others) and share the general feeling of held in or pushed out. In LIL TIG with a lot of symptoms relating to uterus, the foetus is held in by the sphincter of the uterus until it is ready to come out, when it is forced out. If this happens to early abortion results, hence LIL TIG has ailments from abortion. In VERATRUM ALB everything is sudden, acute, has the feeling of forced out and excluded suddenly. The main feeling is FEAR will loose his social position and this would happen suddenly. Thrown out of his of his job, his home, his thrown, his kingdom. SUDDEN AND SEVERE; SUDDEN sinking of strength. Attacks of pain, which produce delirium and mania for a short time. Vomiting and diarrhoea; SIMULTANEOUSLY [Verat. and Ars. main remedies]. Sensation of coldness is often local [lump of ice on top of the head] or can be general coldness. Cold sweat, breath, tip of nose, vertex, chest, extremities. Raynauld’s syndrome. Cold feeling in blood vessels – bones; or sensation of heat in blood vessels. Violence, loquacity, < during pain. Prays, curses and howls in turn. Over stimulation, even mania; self-righteous, haughty, even delusion of being spiritually exalted or divine. Hyper sexually lewd conduct. Tears, cuts things, especially clothing. Delusion, God communication with, he is in. • Delusion, dumb, he is. Busy. • Restless • Industrious. Cheerful. • Loquacity. • Liar. Deceitful. • Courageous. • Squanders money. Extravagance. • Praying. • Shameless. Asarum Europeum – This remedy is indicated when a woman feels very ill, with constant nausea and retching. She is extremely sensitive to everything—especially noise, which can aggravate the nauseous feelings. She feels best when lying down and resting. Cool drinks or food may help, but it is hard for her to even think of eating. Bryonia – A person needing this remedy usually wants to stay completely still and not be talked to or touched. Nausea and vomiting, with pain and pressure in the stomach, can be worse from even minor movements. The person may have a dry mouth and want cold drinks. This remedy can also help with constipation. Cocculus – Indications for this remedy include nausea or motion sickness, dizziness, palpitations, headache, numbness, and an empty or hollow feeling in various parts of the body. The person may talk nervously, yawn, or tremble, and is likely to feel extremely weak. Colchicum – Horrible nausea that is worse from the sight and smell of food (especially eggs or fish) often indicates this remedy. The woman retches and vomits, and has a sore and bloated feeling in the abdomen. She has trouble eating anything — although she often craves things, when she tries to eat them they make her sick. She is likely to feel ill from many smells that others don’t even notice. Ipecacuanha – This remedy is indicated for intense and constant nausea that is felt all day (not only in the morning) with retching, belching, and excessive salivation. The woman may feel worse from lying down, but also worse from motion. Even after the woman vomits, she remains nauseous. Kreosotum – When this remedy is indicated, the woman may salivate so much that she constantly swallows it, becoming nauseous. She may also vomit up food that looks undigested, several hours after eating. Lacticum acidum – This remedy is indicated for “classic morning sickness”: nausea worse immediately on waking in the morning and on opening the eyes. The woman may salivate a lot and have burning stomach pain. She usually has a decent appetite and feels better after eating. Nux vomica – Nausea, especially in the morning and after eating, may respond to this remedy—especially if the woman is irritable, impatient, and chilly. She may retch a lot and have the urge to vomit, often without success. Her stomach feels sensitive and crampy, and she may be constipated. This remedy can also help with constipation. Pulsatilla – This remedy can be helpful if nausea is worse in the afternoon and evening (often in the morning, as well). The woman is not very thirsty, although she may feel better from drinking something cool. She can crave many different foods, but feels sick from many things (including foods she craves). Creamy foods or desserts may be appealing, but can cause discomfort and burping or bring on vomiting. A woman who needs this remedy usually is affectionate, insecure, and weepy—wanting a lot of attention and comforting. Sepia – Gnawing, intermittent nausea with an empty feeling in the stomach suggests a need for this remedy. It is especially indicated for a woman who is feeling irritable, sad, worn out, and indifferent to her family. She feels worst in the morning before she eats, but is not improved by eating and may vomit afterward. Nausea can be worse when she is lying on her side. Odours of any kind may aggravate the symptoms. Food often tastes too salty. She may lose her taste for many foods, but may still crave vinegar and sour things. This remedy can also help with constipation. Tabacum – This remedy can be helpful to a woman who feels a ghastly nausea with a sinking feeling in the pit of her stomach. She looks extremely pale, feels very cold and faint, and needs to lie very still and keep her eyes closed. If she moves at all, she may vomit violently—or break out in cold sweat and feel terrible.